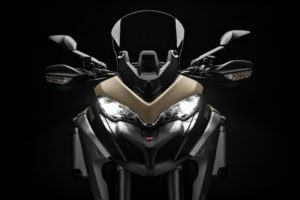 The Multistrada has been one of Ducati’s best-selling models since launch, fwith the “4 in 1” bike first arriving in a 1200 cc version, and recently, and after some changes to that engine, Ducati has increased its displacement to a 1260 engine and with DVT technology to control the timing of the valves. 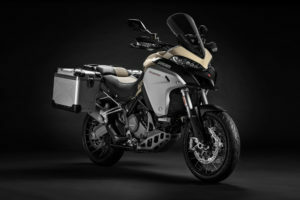 But that engine has only been used on the road versions of the Multistrada, while up until now the 1200 was used on the Enduro off-road model. 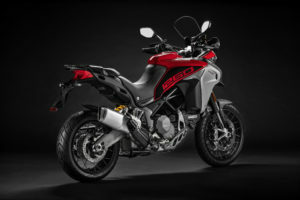 That has all changed, when Ducati recently announced a new Multistrada 1260 Enduro to complete the MTS family in the Italian brand lineup. 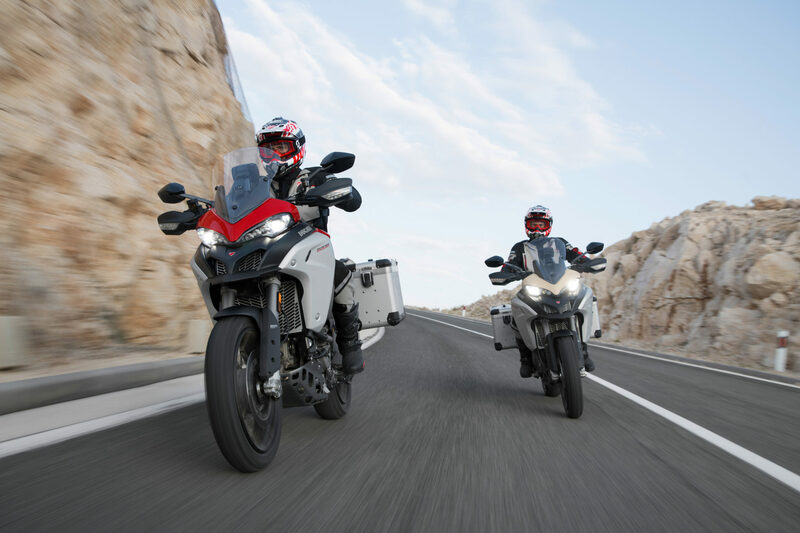 The 2019 Multistrada 1260 Enduro gains more displacement with the Italian engineers using a longer piston stroke of 71,5 mm. Maintaining the bore at a massive 106 mm, the Testastretta DVT engine reaches 1262 cc, and its inside now gets new piston rods, cylinder and a crankshaft different from the previous generation. 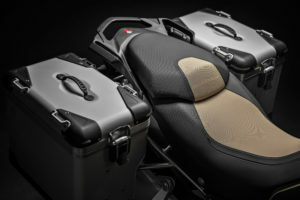 This has also allowed Ducati to recalibrate the DVT system, with the focus being torque delivery at low and mid RPM’s. 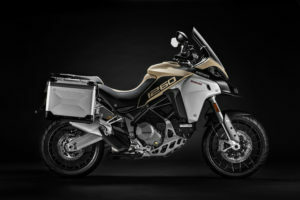 IT means most of the torque is now delivered below 3500 rpm, and at 5500 rpm Ducati notes that torque delivery improves by 17% compared to the 1200 Enduro. 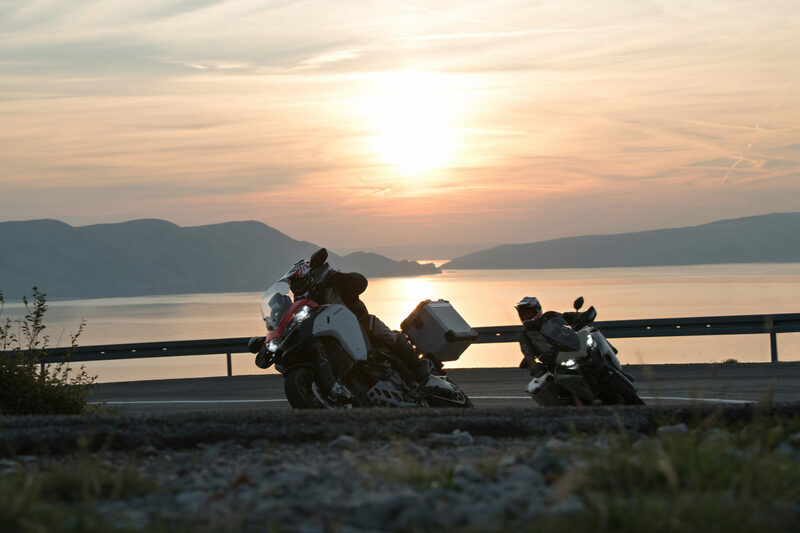 Another benefit from the bigger displacement is the power increase, and the Multistrada 1260 Enduro sees the power reaching 158 hp. Behind the new alternator cover, there’s a new gear sensor, vital for Ducati. 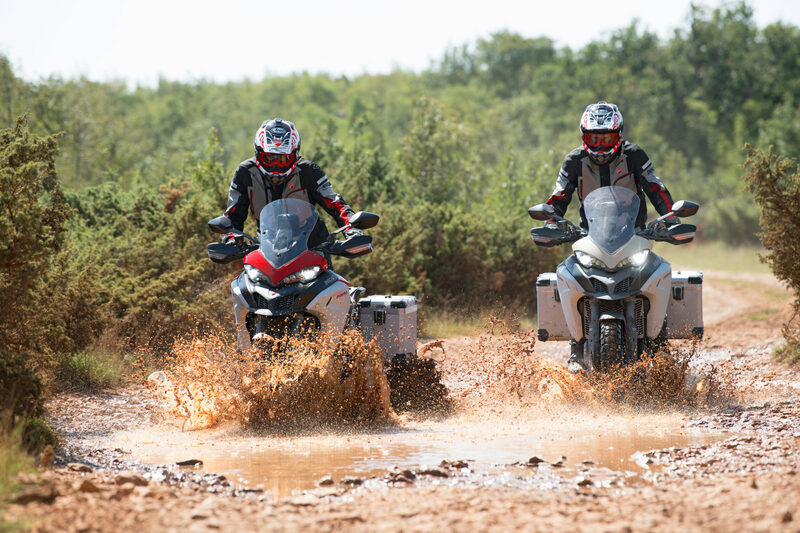 That’s because the 1260 Enduro now features DQS – Ducati Quickshift. This works for both up and downshifts without using the clutch. 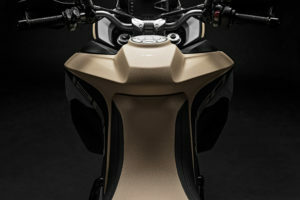 Inside the Multistrada 1260 Enduro there’s also more big news! Ducati fitted a new brain, or ECU, more powerful and able to cope with the bigger amount of data collected by the new sensors that come along with the new six axis Bosch IMU unit. As usual, this IMU unit controls a lot of riding aids or functions: Ducati Wheelie Control, Ducati Traction Control, Cornering ABS from Bosch, and an important function named Vehicle Hold Control (VHC). 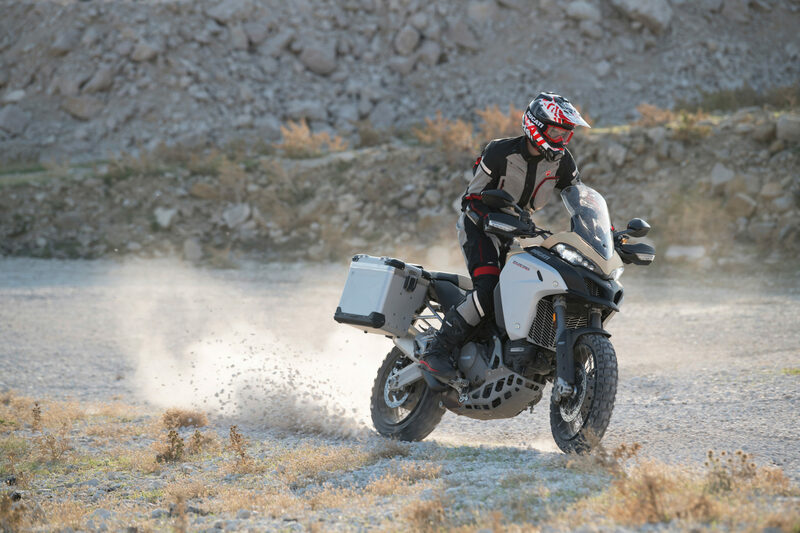 The VHC allows the rider to easily start moving from a standstill in an uphill terrain, very helpful in off-road situations, where it’s always more difficult to control the throttle trying not to let the rear wheel spin out of control. The VHC is activated by high pressure at the brakes, and will disengage automatically when the bike starts moving or after a 9 seconds period. 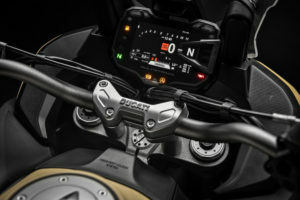 Four riding modes are available – Sport, Touring, Urban and Enduro – all of which have these electronic aids predefined, but Ducati allows the rider to adjust each mode to the rider’s preferences. 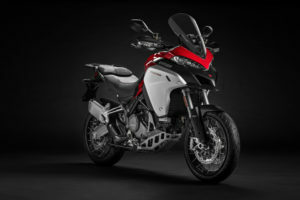 And speaking of electronic things, the new Multistrada 1260 Enduro also gets an updated Ducati Skyhook electronic semi-active suspension, both at the front and rear. The front fork is new, from Sachs, and the suspension software has also changed with new parameters, to adjust the suspension based on the more powerful and effective IMU unit. 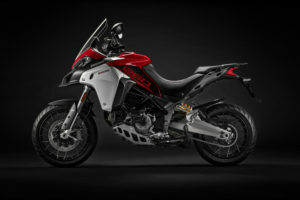 Connecting the bike to the asphalt or dirt, Ducati chose to ask Pirelli to develop a special version of their Scorpion Trail II tyre, said to last longer and help the rider to explore better and in a safer way the performance of the updated engine, and the rider will be able to control every function of the Multistrada 1260 Enduro through a new 5-inch TFT screen. Ducati also says that the rider will benefit from an updated riding position. Seat height is 10 mm lower, there’s a lower handlebar (-30 mm), the frame was revised to be lighter, and the fuel tank cover has a new design to help the rider get a better feeling of the bike. Ducati says these changes improve ride comfort and high-speed stability. 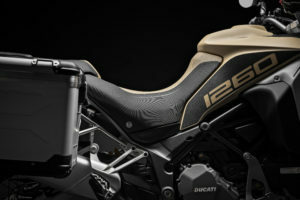 Finally, but not least, the Italian brand created new paint schemes in Ducati Red and Sand. All in all, this new Ducati Multistrada 1260 Enduro seems to be prepared to battle for the crown of the maxitrail and adventure segment. It still is the “4 in 1” bike Ducati created a few years back, but it’s now much more adventurous and without limits.